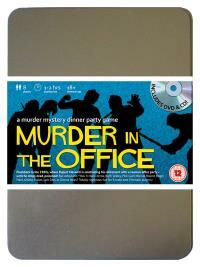 You've been invited to play the role of WANDA ROUND in Murder In The Office. Who killed the boss? Everyone has stayed after work to attend Rupert Maxwell’s retirement party. Not because they like him, but because they want to make sure he is really going, once and for all. With no expense spared, his P.A. has organised an Eighties throwback disco and the cheapest bubbly money can buy - but just as the party starts the bloated M.D. falls down dead. Find out who made Maxwell’s party a real choker! Receptionist (she’s fun and flirty and a little bit dirty!) Costume : Goth fashions are a must for Wanda, with black jeans, skirt or dress. Lots of silver jewellery, eye make-up and most importantly – any type of piercing is desirable. Couple with multicoloured nail polish and a terrible phone manner. As the newest member of the team at Maxwell Enterprises, you like to think you’ve brought a certain vitality to the workplace. You’re bubbly and bright and always make an effort to smile. Although your employment history to date is a little on the patchy side, you’re hoping to make a fresh start with this job. Your main interests are clubbing, shopping and flirting.